Last week we exposed Apex Scotland employee Paul Belton, a closet sectarian bigot, hater of all things Rangers and close friend of Celtic Chief Executive, Peter Lawwell and his family. With this article we will concentrate on Belton's family. Paul regularly tweets to his cousin, Michael Lynch, a.k.a. @Sgt_trousers on Twitter. The cousins both grew up in and around the Newton Mearns/Barrhead area of Glasgow. Much of their communication is made up of their salacious hate for Protestants, Rangers and anything to do with the club. Michael Lynch is a senior employee within HMRC and if we are to believe he has an understanding of the Civil Service Code of Conduct, he should know better than to use Twitter to wage his bigoted sectarian, and at times homophobic, views under the guise of his @Sgt_trousers alter-ego. Lynch also wears the "Obsessed" badge of honour emblazoned on his profile, fixating on the idea that Rangers fans are "zombies". You will recall that @padrepio1916 is of course Paul Belton. Well, it used to be. After our exposé, his Twitter account has been shut down. Don't worry, just Google "@padrepio1916" and you can still see the details of his account and sectarian behaviour. In the two tweets above, Lynch uses the word “Hun”, an offensive, derogatory term for a Protestant. The latter giving a link to an article on suspended animation: http://www.extremetech.com/179296. Michael Lynch is not the only Lynch in a senior position at HMRC, his wife Anne is too. 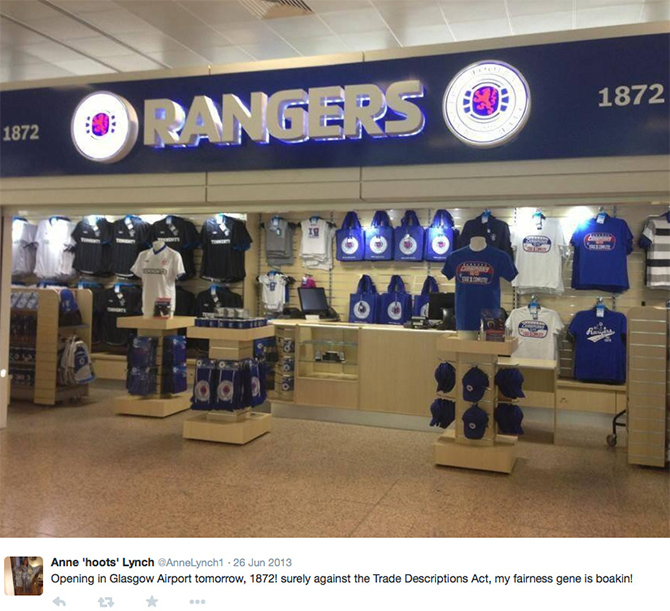 It seems that Anne Lynch also has a hang up about Rangers as shown in the tweet below. Maybe Anne shares the same "obsessed" gene that her husband has. The Lynch's are close friends with another HMRC couple, Arlene & Derek Sugden. Arlene is an Assistant Director at HMRC and Derek heads up a one of the HRMC debt management teams. All have senior positions within an organisation that was belligerent to the existence of Rangers Football club. The Lynch's, with their zombie obsession, thought it would be a good idea to host a New Year’s party for some close friends and family. It wasn't the run of the mill New Year party. Michael thought it would be a good idea to have the theme of “Zombies”, mocking the club and fans he obsesses over. The Sugden's and Paul Belton were part of the small guest list. Second from the left, Paul Belton. Third from the left Derek Sugden, Red Dress - Arlene Sugden, Below Arlene, Anne Lynch and on the far right, Michael Lynch. (Click image to zoom). 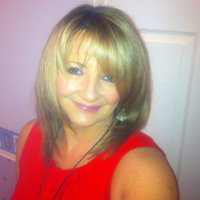 Arlene Sugden in her capacity as an Assistant Director at HMRC visited various football clubs in the UK. As can be seen from her social media pictures she visited The Emirates Arena, Stamford Bridge, Ipswich Town and Manchester United, so she might know a thing or two about what’s going on with regards to tax matters in the football world. Do we know for sure the Sugdens passed on confidential information to haters of our club? No, we can’t be sure. But what we can be sure of is that Arlene Sugden is NOT Data Protection compliant as shown in the photo below. Some of the emails on Arlene’s (government issued?) laptop are marked restricted and protected, yet the names of the authors, and the subject matter can clearly be seen. 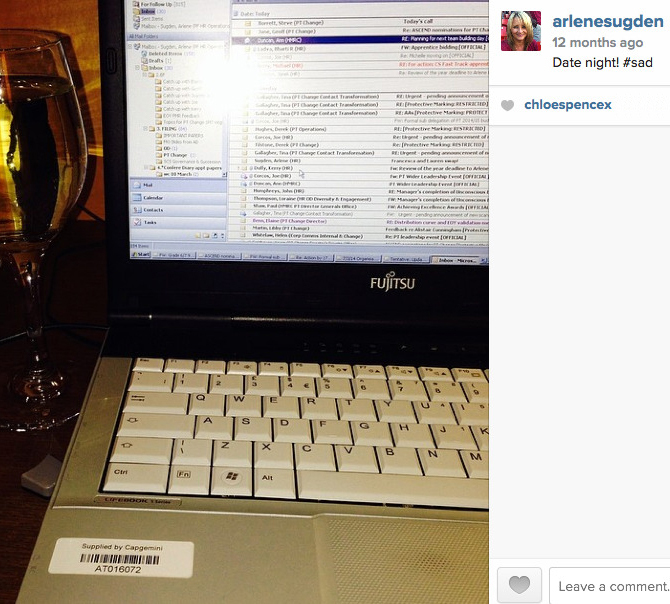 Is that a glass of white wine next to the laptop? If Arlene is this loose on social media, she may be even more forthcoming when having a discussion with friends about Rangers while under the influence. In the tweet below, Arlene’s friend and co-worker Michael Lynch took great pleasure in tweeting that HMRC would be “visiting Govan” again. Was this leaked privileged information with which he couldn't hide his delight? We demand that HMRC addresses the issues raised in this article, such as the ingrained anti-Protestant attitude of Michael Lynch and, to a lesser extent, his wife. The issues of lack of confidentiality and Data Protection from Arlene Sugden. HMRC needs to fully satisfy the public that the Lynch's and/or Sugdens were not passing on confidential tax information about Rangers FC to Paul Belton, which may have then ultimately been passed to the Lawwells and Celtic FC. Then again HMRC have already failed to address their employee Bill Mcreath and his sectarian rants. One wonders if it was either of the Sugdens or Lynches that were dealing with Mcreath’s discipline issue.